The latest update of Legacy Family Tree (8.0.0.499) includes a neat new feature. 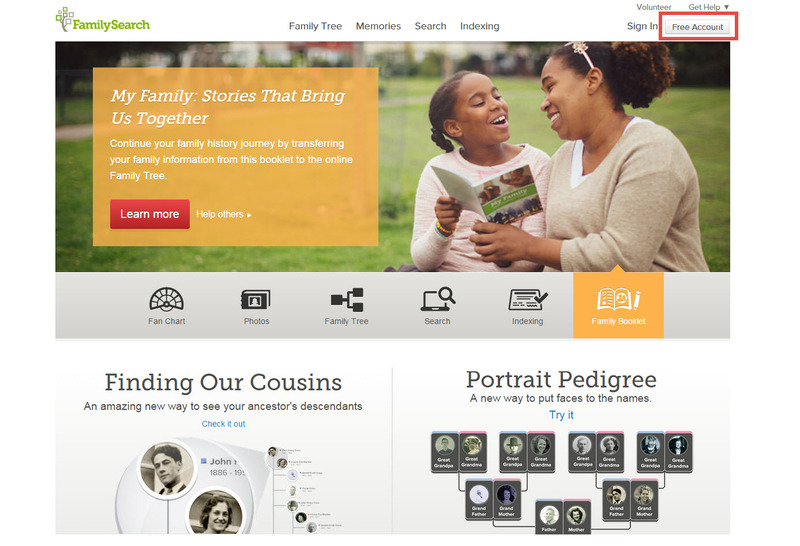 Users are now able to download sources from FamilySearch. I downloaded this update today and then tried out this awesome new feature. I think this is a great new tool and thought I'd share what I learned about it with you today. 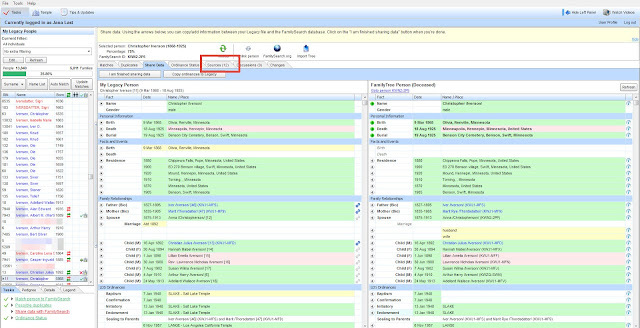 In order to add FamilySearch sources to your Legacy database, the "Integrate with FamilySearch" option needs to be checked. To do this, simply click on the "Options" tab, then click on "Customize." Scroll down to FamilySearch and check "Integrate with FamilySearch" and click Save. 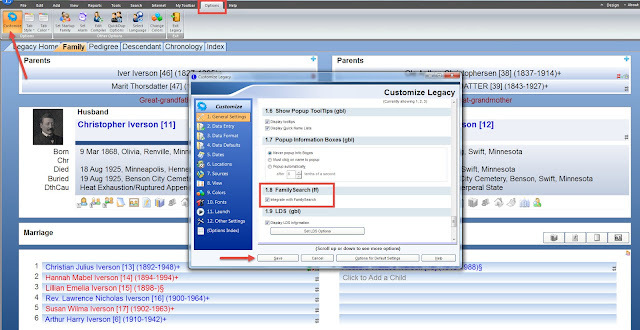 By the way, you will need to have a FamilySearch account to integrate your Legacy database with FamilySearch. It's free to sign up and you don't need to be a member of The Church of Jesus Christ of Latter-day Saints (LDS) to have a FamilySearch account. 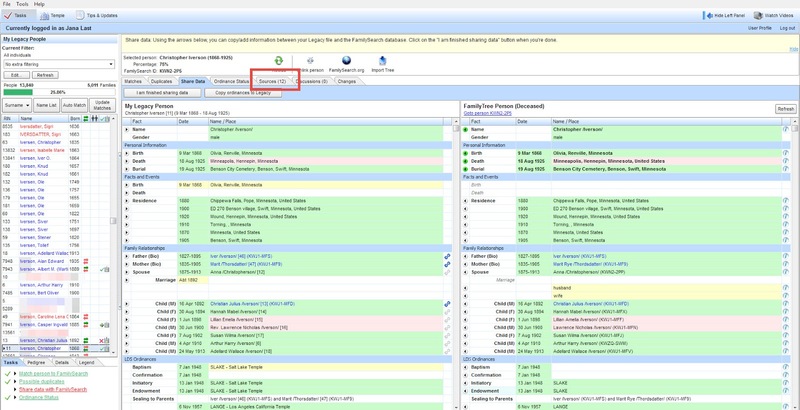 Now that your database is integrated with FamilySearch, I'll show you how to add FamilySearch sources. You can do this two different ways. One way is to click on the arrows next to your ancestor's name. Or you can click on the "FamilySearch" tab at the top. Clicking the arrows or the tab will cause a new window to appear which looks like this. Click on the "Sources" tab. As you can see from this screenshot, there are lots of FamilySearch sources that I can add to my Legacy database for my great-grandfather Christopher Iverson. To add a FamilySearch source, click on the little black arrow to the left of the source title. A box like this will appear giving you the option to choose the source tags you want to check. I added the first source and continued adding more sources for Christopher Iverson. When I clicked on the round information button on the far right in the FamilySearch Sources side of the screen, this box appeared indicating which Source Tags were associated with that particular source. These source tags are also represented by the bright green dots as well. 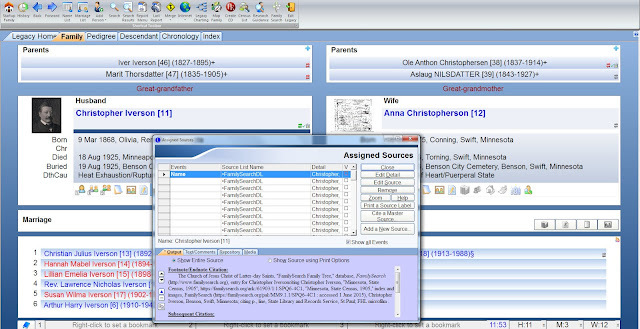 I copied all of the FamilySearch sources over to my Legacy Database for Christopher Iverson. Here's the family view for Christopher Iverson in my Legacy Database. To see the FamilySearch sources I just added, I just clicked on the sources icon. And here are some of the sources I had just added. I hope this little tutorial has been helpful for you. I think this new feature in Legacy Family Tree is pretty awesome! It really is awesome news! And thanks for your kind comments. I'm glad you found my blog post helpful. Thanks for stopping by Magda! Very interesting post Jana. 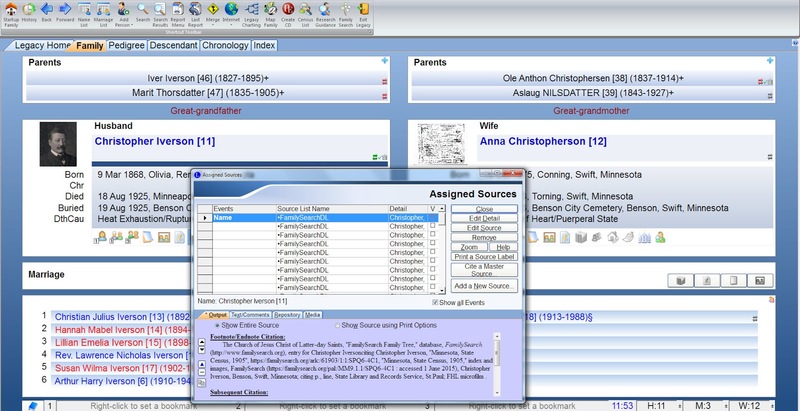 Ancestral Quest 14 is also certified to access, update and sync with the FamilySearch family tree database.There is a little briefcase on my side that allows me to send my sources to FS but I didn't know AQ also has the feature to move sources from FS to an AQ database. In a test run the source citation has all the information needed but didn't fill in the information in the Source and Source Citation boxes the way I would. All information was placed in the Comment about Source box. A bit of tweaking and it works! Thank you! That's cool that Ancestral Quest has a similar feature. Thanks for stopping by! Thanks for stepping us through this Jana! Do you know if the "integrate" option automatically uploads anything from Legacy into FamilySearch or visa versa or if it just allows the programs to "talk." I sure would rather decide person by person and source by source if anything should be added rather than have it add names, sources etc. automatically. can I generate genealogy reports and charts with Legacy?